In the coast of Peru and in a few other Latin American countries you'll find a drum that is square. Originally made out of dresser drawers or crates used in shipping, this instrument has an amazing sound all it's own. Played like any other drum, you can strike it with your hands, palm, fingers and create wonderful rhythms. A cajon is basically a box with a round-shaped sound hole. So, a simple project would begin with a cardboard box of any size--even a shoe box will do. For a sturdier project, you can buy a wooden box at a craft store or look for one at a produce store. An adult that does basic wood crafting can also help you to assemble a wooden box to begin your project. Next, you'll need a sound hole--the place where the sound will escape. Draw and cut a circle from your cardboard boxes or have an adult help with the preparation for the heavier wooden boxes. Although most sound holes are round, you could experiment with other sizes and shapes as well and see what happens! If your cajon is made of paper or cardboard, use anything you like to decorate it. Paper, paint, ribbons, stickers, photos, drawings, sharpie pens or rubber stamps. If you are working with wood, you can also use paint and pens and you may wish to add a coat of lacquer afterward to keep your designs from fading. All drumming is played by creating a series of patterns. Strike your box and get to know its different sounds. Then mix them and match them to make beats, or find out how your beats can play along with your favorite songs. 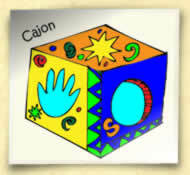 Your cajon will sound great played with Latin American songs. If you like, you can play along to songs like La Bamba and La Cucaracha!